Not more than two days ago, The Hobbit fandom became excited with some new covers for the movie tie-in version of the novel. One was particularly assumed to be a teaser poster, featuring the gigantic gaze of Smaug, reflecting the unsuspecting Bilbo Baggins. Now a new The Hobbit: The Desolation of Smaug teaser poster to top them all -- or should I say to rule them all -- has arrived. 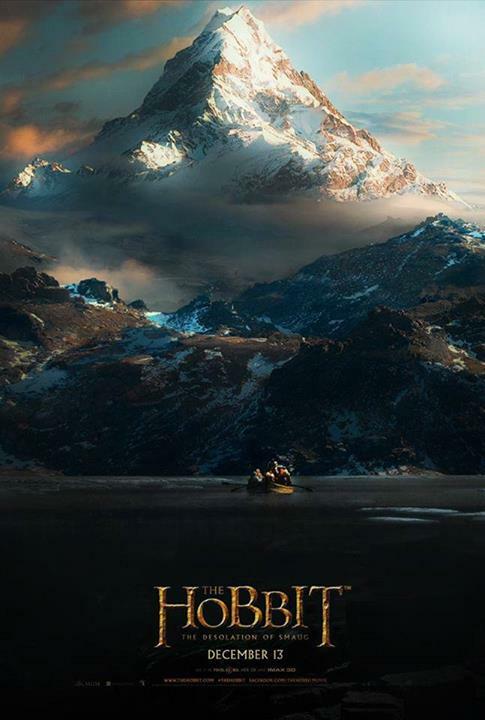 The new poster features the scenic Lonely Mountains looming in the background with its icy peak. We don't need to wonder who's aboard the boat in the poster, because for sure its the same jolly lot we've learn to love in The Hobbit: An Unexpected Journey. Check out the new poster of The Hobbit: The Desolation of Smaug. Once again I just hope this isn't any fan made poster, but an official one. The poster is a little too familiar, because we have seen it in the trailer before as depicted from this screen capture. Many will be set afire in The Hobbit: The Desolation of Smaug, to be released on December 13, 2013.